Successfully Added Sangdo Generation 2 300ml Essential Oil Aroma Diffuser-US Plug to your Shopping Cart. 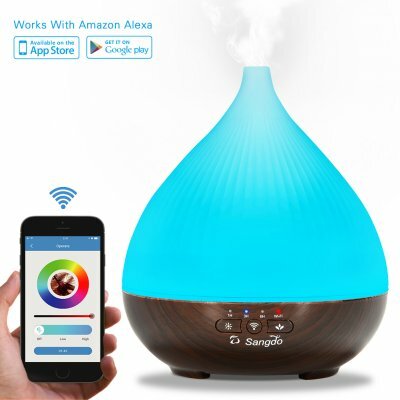 LATEST GENERATION 2 Sangdo AROMA DIFFUSER: Works with Amazon Echo/Echo/Tap can not only powering on/off but also changing the light colors conveniently by sound. While most generation 1 can only use voice to turn on / off the aroma diffusers. APP CONTROL: Download our specially developed and upgraded App named "Umist plus" which is compatible with Android system and IOS on your smart-phone to control the Sangdo aroma diffuser remotely such as powering on / off, changing the light colors, adjusting the mist quantity, setting timer working hours.